Could Tram-Trains Be Used To Advantage In Blackpool? Blackpool tramway is unique in the United Kingdom in that it runs a mixture of modern and heritage trams, which I’ve only seen done on a big scale in Lisbon, where like Blackpool, the heritage trams are a tourist attraction. It may also be unique in that it is already tram-train ready in terms of dimensions, power supply and other details according to this report on the Sintropher web site. Blackpool’s trams have two major problems. The obvious one is that the trams do not serve the main railway station at Blackpool North. The second is that the trams don’t connect well to any of the stations served by the Blackpool South to Colne service. The best connection is a two hundred metre walk between Squires Gate station and Starr Gate tram stop. The branch to Blackpool North is being electrified and this should be completed in 2017. The final report of the North of England Electrification Task Force has also recommended that the lines from Burnley to Colne and Kirkham to Blackpool South be electrified in the Tier Two group of lines to be wired. So it would be reasonable to assume that in a few years Blackpool will have two stations with electric trains to Preston, Liverpool and beyond. This is a Google Earth image of the area between the two stations. 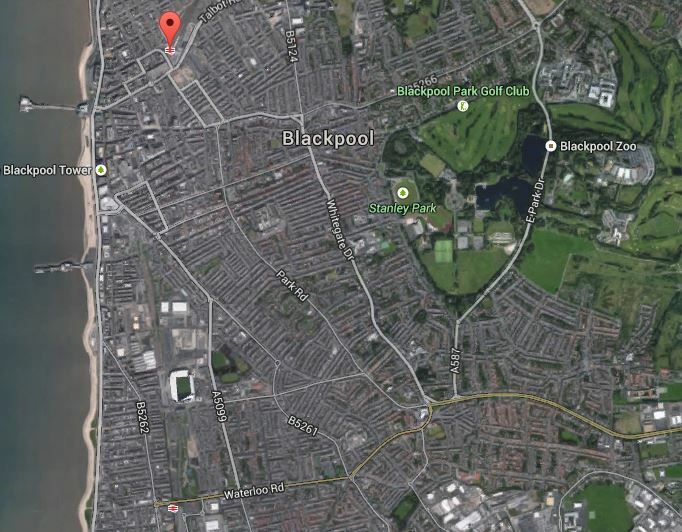 Blackpool North is indicated by the red arrow and Blackpool South at the bottom of the image, about five hundred metres or so from the sea front and a short walk south of the football ground and extensive car parking for visitors. Neither the football ground or the car parking are well served by the current tramway. 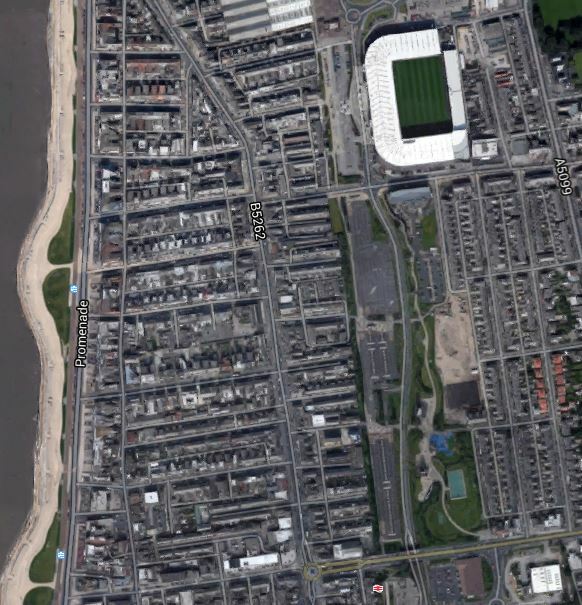 This Google Earth image shows the area north of Blackpool South to the football ground to a larger scale. I feel that it should be possible for a tram to start northwards from Blackpool South station, go past the car parks and the football ground and then thread its way through to the main tramway route along the sea front. To the south of the station the rail line is single track all the way to Kirkham and Wesham station, where it joins the main Blackpool branch to Blackpool North. As this line is now slated for electrification, there are probably cases to electrify it to either main line standard or make the line an extension of the tramway. If tram-trains successfully pass their trial between Sheffield and Rotherham, then surely using tram-trains to work the services between Blackpool South and Colne, will be looked at seriously. One factor that could come into the discussion about upgrading of the Blackpool South branch is the important golf course at Royal Lytham and St. Annes, as Ansdell and Fairhaven station is adjacent to the course and is used to transport spectators for important tournaments. So when will the next Open Championship be staged at Royal Lytham? At Blackpool North station, the tram extension is now funded and is being planned. But will the announcement of electrification to Blackpool South and hopefully successful trialling of tram-trains in Rotherham, add extra possibilities to how the extension to Blackpool North station is implemented? 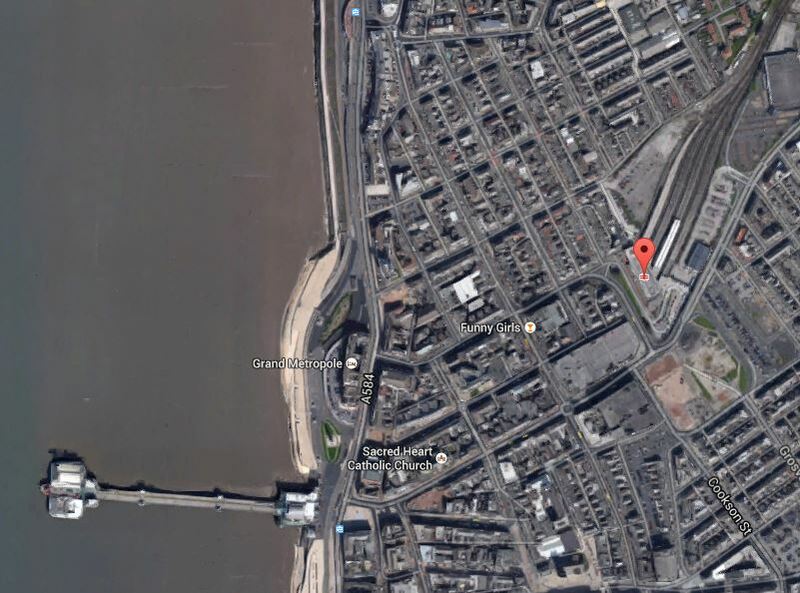 This is the Google Earth image of Blackpool North station, which is indicated by a red arrow, to the sea front. Wikipedia also indicates that the spur to the station will join the main tramway north of the North Pier, which is the pier shown in the image. One possible way of building the spur, would be to make it compatible with tram-trains so that some trains arriving at Blackpool North could transfer to the tramway. If both Blockpool stations were to be served by tram-trains that then ran between the two two stations, then would be an example of the classic Karlsruhe model that has been successfully working in the city since 1992. Between the two stations, they would work as trams and once clear of the tramway, they would work as normal trains. The tram-train services would probably be on a simple loop between the two stations, with tram-trains turning back at either Kirkham and Wesham or Preston stations. Alternatively, services could be something more substantial serving the wider area. Certainly some tram-trains would go all the way to Colne to replace the current service. But whatever is done, if tram-trains are used to link the two stations, various advantages will be seen. 1. Long distance services into Blackpool North would have easier access to the tram network, which would probably be step free. 2.As Preston would probably have more trains to Blackpool, this would give Blackpool better access to other long distance services to say Glasgow, Edinburgh, London and Birmingham. 3. Local services running tram-trains from perhaps Preston and Colne would have immediate access to some of the central tram stops in Blackpool, as these stops would be on the link between the two stations. 4. Blackpool South station would become a simple tram stop. 5. Space might also be released at Blackpool North station, depending on how much space was needed for the tram-train stop. 6. Extra trams would be running on the busiest central section of the tramway. 7.If the football ground and the main car parks were on the central loop, this would improve transport links to the town. Probably the most difficult thing to get right would be the ticketing method, which London has shown must be based on a contactless bank card. With the announcement that the East Lancashire Line is to be electrified to Colne, there would be no problem running tram-trains through both Blackpool stations and then through Preston and on to Colne. The line from Rose Grove to Colne appears to be mainly single track, with some stations looking like tram stops, with a pile of bricks at the track-side. If tram-trains were to run on the Colne Line as trams, this would actually be a service upgrade, despite the apparent downgrading of the line from trains to trams. If the powers-that-be thought that more stops were needed, these would be simple affairs, with a low platform on one or both sides of the track, with perhaps a simple shelter and a ticket machine. As on other tram lines in the UK, passengers would walk across the line rather than use an expensive footbridge. To see what is possible on a good tramway, look at this post about good stop design for trams and tram-trains. But the two biggest improvements would be a much more frequent service, that probably ran at least twice an hour on weekdays and hourly on Sundays, that used new comfortable electric low-floor tram-trains something like the Class 399, being used for trials in Sheffield. As to speed, the increased acceleration of the tram-trains would mean that stopping wasn’t as time-consuming as on say a Class 142 train. also outside of urban areas and some way from stops, they would be able to run at a more appropriate speed using the railway rules currently in force on the line. Incidentally, some UK trams like Croydon and Edinburgh go faster than you think when the track allows. Tram-trains would appear at a cursory glance, to be a simple and affordable way to improve services in this neglected part of Lancashire. Burnley is one of those places most famous outside the local area for football, but it is a market town of over seventy thousand people. The town probably needs improved transport connections, despite having four railway stations, the most important of which; Burnley Manchester Road has recently been rebuilt. A big improvement will come by electrifying all of the lines, which will mean that Rose Grove and Manchester Road, will be on an important electrified artery between Leeds and Preston. The other line is the Colne Branch of the East Lancashire Line and this has three stations in the town; Rose Grove, Burnley Barracks and Burnley Central. This Google Earth image shows the four stations as they relate to Burnley. Rose Grove is at the West, just to the south of the M65 motorway and is served by both lines. The Colne Line curves to the north with the two stations at Barracks and Central to the western end of the town centre, which is indicated by the red arrow. Manchester Road station is at the southern edge of the image, a steep walk up the hill from the town centre. If the Colne Line were to be run by tram-trains, would this create a better and more accessible railway for Burnley. 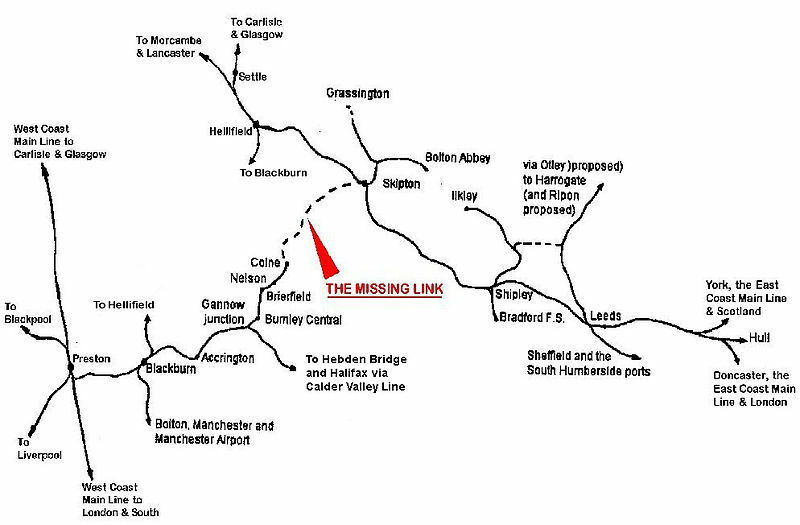 As an example of what could happen, north from Burnley Central , the Colne Line follows the Leeds and Liverpool Canal, so are there possibilities to use a tram-train to give better access to the countryside above the town? Using tram-trains on the Colne Line could improve public transport in Burnley and the other towns like Nelson and Colne, without laying a metre of new expensive railway. But why stop the trains at Colne? The final report of the North of England Electrification Task Force has also recommended that the lines from Skipton to Carlisle via Settle be electrified in the Tier Three group of lines to be wired. The Skipton – East Lancashire Rail Action Partnership is also campaigning for the line between Colne and Skipton to be reinstated. This map of the missing part of the line is taken from the Wikipedia entry. Would the missing link be easier and more affordable to build, if it continued as a modern, single-track tramway? This type of line would also be less visually intrusive, if it used 750 V DC overhead wires, which are all that would be needed for the Class 399 tram-train. Building this link between Skipton and Colne would further connect the electrified lines in the Leeds area, with the soon to be electrified ones of North Lancashire. As the map shows, Skipton is on the iconic route through Settle between Leeds and Carlisle, which is also in the queue for electrification. Skipton is the key to the success of any scheme to improve the Colne Line and link it to the town. The town is known as the Gateway to the Dales and already has direct services to London. This section in Wikipedia shows that there are impressive plans for services in the future. But that was written before the North of England Electrification Task Force reported that Skipton to Carlisle through Settle was an electrification scheme for Tier Three. This was probably included more for freight reasons, as it creates a new route for electrified freight trains from Yorkshire, the East Midlands and the Electric Spine from Southampton to Scotland. And to think that the line was nearly closed, but a certain Michael Portillo didn’t sign it off! So will we see electrified passenger services from the South coming up via Leeds and Skipton to Carlisle? I think we will and if the Borders Railway is a success, then I think in perhaps 2040, these trains will reach Edinburgh. So I think this all means that the tram-trains to Colne, should be used to create a link to Skipton. Currently there is just a measly single train each hour between Blackpool and Liverpool. Ormskirk to Preston is another line that could be chosen for electrification and it is likely that under the Liverpool rules it will be served by four trains per hour. So I think it is reasonable to assume that when electrification to Blackpool North is complete, that the frequency of Liverpool-Blackpool services will be increased. After all when electrification is complete various routes via Ormskirk, Wigan, Newton-Le-Willows and St. Helens will all be possible. But the possibility also exists for the use of tram-trains on this route, which will then go round the loop in Blackpool. Obviously, passenger numbers will determine what services are worth trialling. There is also the possibility of linking Royal Lytham and St. Annes with the other high-quality golf courses south of Southport. The Blackpool tramway could use tram-trains to connect the electrified stations at Blackpool North and South, and over a wider network, especially over the Colne Line and its possible extension to Skipton. This article on the Modern Railways web site reviews the first year of the Two Together Railcard. This is said. The RDG says that the average cardholder has saved £127.48 on rail travel over the course of the year, including the £30 cost of the Railcard, a total saving of over £20 million. Success is an overworked word, but this simple marketing promotion, seems to have been a big one. I wonder how many other countries will copy this idea.